Convert Word, Excel, TXT, PowerPoint and All Printable Files into PDF Documents. Convert PDF Documents into Word, TXT, JPG, HTML and Flash Files. Convert Scanned Images(BMP, JPG, TIF, GIF etc) into PDF Document. Batch Convert More Than 10,000,000 Files at One Time. PDFTiger is a Word To PDF Converter and PDF To Word Doc Tool that quickly and accurately create PDF documents from Word, Excel, Powerpoint, txt or Images. PDFTiger can also convert PDF files into editable MS Word Documents, Rich Text Documents, Plain Text Files, Images, HTML Files, and Shockwave Flash SWF Files. 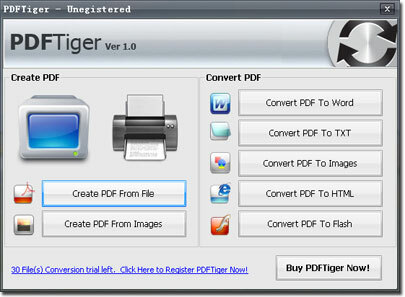 In batch mode PDFTiger will convert more than 10,000,000 files at a time. 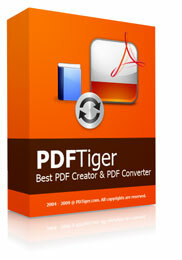 2004 - © PDFTiger - Word To PDF Converter - PDF To Word Doc. All rights reserved.